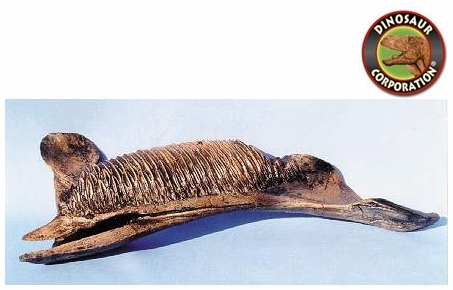 Parasaurolophus walkeri Jaw. Dinosaur fossil Replica. Complete left jaw with dentary of the plant eater of the Cretaceous US and Canadian mountain states. Parasaurolophus is the most famous of the crested hadrosaurs. It was small animal, compared to the other North American hadrosaurs, but it had the largest crest of any duck-bill. Parasaurolophus lived in the forest region, but it has also migrated to the plains, semi-arid and the swamp regions. It was a herbivore, a herding animal, falling into a rigid social hierarchy. Males seem to achieve dominance in relation to the coloration of their skull crests. The females were capable of creating sounds at lower frequencies; they have repeatedly attracted the attention of the more brightly-colored males. This duck-bill had a long tubular crest that curved back from its snout and seems to have been larger in the males than in the females. This crest was an elongated, curved structure, longer than its skull. It contained two hollow tubes, believed to be for the creation of sound. Parasaurolophus is able to use these tubes to communicate with its fellow herd members. This crest was probably used to produce a loud bellow or call by exhaling air from these tubes within. Parasaurolophus was a good swimmer and had strong arms and a tail which was flattened from side to side. It was able to walk on two feet as easily as four. TIME - 76 to 65 MYA, Late Cretaceous period. RANGE - USA - Montana, Alaska. Canada - Alberta. DIET - Various plants, including aquatic varieties.